Results of mathematical simulation of the distribution of the concentrations of carbon and alloying elements in the zone of interaction of dissimilar microvolumes formed by spark plasma sintering of particles of steels 12Kh18N10T and U8 at various sintering temperatures and times, results of investigations of the structure of the specimens, and results of a regression analysis of experimental data are presented. The laws of formation of transition zones are described with the use of regression analysis based on the generalized lambda-distribution and on the method of truncated least squares. The processed data make it possible to identify the effect of the sintering mode on the structure of the transition zones. The results of the diffraction studies and their statistical analysis prove the results of the statistical simulation of the chemical composition. Translated from Metallovedenie i Termicheskaya Obrabotka Metallov, No. 10, pp. 66 – 71, October, 2018. The work has been performed with financial support of the Ministry of Education and Science of the Russian Federation (Agreement No. 14.610.21.0013, Project Identifier RFMEF161017X0013). Diffusion Constants’ Database // URL: http://diffusion.nims.go.jp/en/ (date of access 10.05.2017). 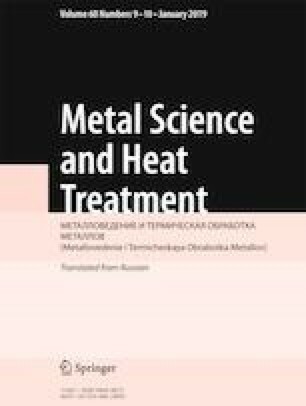 V. A. Litvak and N. P. Belokopytov, “High-nickel corrosion-resistant steels,” URL: https://zaobns.ru/articles/58/ (date of access 10.05.2017).